Chatting to someone I had just met at a business breakfast, we were ‘finding common ground’ that you do when you first meet. She shared that her organisation is undergoing a significant software change project. They have appointed a vendor (software supplier) and are in the process of replacing 55 legacy systems (that’s a lot). They’ve selected a tier one software provider and they’ve got experts coming out of every orifice. But still, there was this disappointment about how the process was going. The gap between what they’ve been sold and what they must do to get it anywhere NEAR working that way was not clear to her from the outset and the effort ahead was starting to dawn on her. I’ve seen this before, I call it software disappointment, it happens all the time in software projects, and you can see how. The vendor wants to show the very best of how their software works, they want to impress their potential client and show that their software is robust, scalable, flexible and most importantly SOLVES the client’s problems. So, they configure it to show the client how it could work, and the client is impressed. They ask many questions, compare the software to others, compare it to their current internally broken systems and get excited about this brave new world that will make every working day easier, more streamlined and end repetitive tasks. To make an investment like this, the client needs to sell the idea internally. To get buy in and endorsement from multiple internal parties the software and the project ahead needs to have a solve problems for multiple business units. So, things are (often) stated in the most positive terms, and the negatives and risks are usually downplayed. This is where the natural optimism of humans works against us a little. People are excited and motivated and executives commit to ‘x’ project (where ‘x’ is the replacement of whole system from end to end), and the software vendor is pleased. They have their work sewn up for the next ‘x’ years and are going to improve the working lives of client and their staff. But (and this is the bit that the software suppliers don’t focus on) it’s going to take an awful lot of the client’s own internal effort and IP to get there. This is the ‘software disappointment gap’. Clients think that because they’ve done all that hard work of selecting a vendor and that the vendor has shown them a system that works a whole lot better than theirs does, that they can relax. In fact, the project work is only just about to begin. It’s like getting a new phone. It doesn’t come installed with all your apps, it doesn’t have your ring tone, links or email, you must set that up. That takes some effort [personal aside, I’ve done it 3 times this year and it’s a pain in the arse]. In an organisation large enough to have 55 legacy systems, that’s a LOT of set up, a LOT of internal consultation and cross business unit collaboration and cooperation required to get the project moving and to implement something that works at least as well as the existing systems do. It’s this internal effort that organisations so often miss, or if they don’t miss it at an executive level it gets missed in translating it out to the wider group. Like my breakfast companion, whilst rationally she could see exactly why this was all needed and she was making the required mental adjustment to the work ahead, she was also choosing not to stay for it. Did I mention she was leaving the business? There was a restructure in her team and she was taking the opportunity to walk away. Smart businesses prepare themselves properly for the work ahead. Create capacity. Sometimes this comes through back-filling roles for key people, hiring extra hands (either permanently or temporarily) or by reworking the structure and make up of a team. But the reality is that a project requires additional work inside the client business. Additional work doesn’t happen without additional capacity! Alignment to the project objectives. It can be forgoing other planned improvements or reigning in expectations about business as usual. A key point is to stop all but the most essential work on old systems once you’ve committed to a new system. It’s a big part of both managing workload and creating commitment to the success of the new project. Improve your communication. It’s a lifelong practice both professionally and personally and it makes all the difference. So many of the mis-steps we make in business and in projects come down to communication. Improving communication of internal team members increases effectiveness. Look for advice from those who’ve done this before, both lessons learned internally and external support. 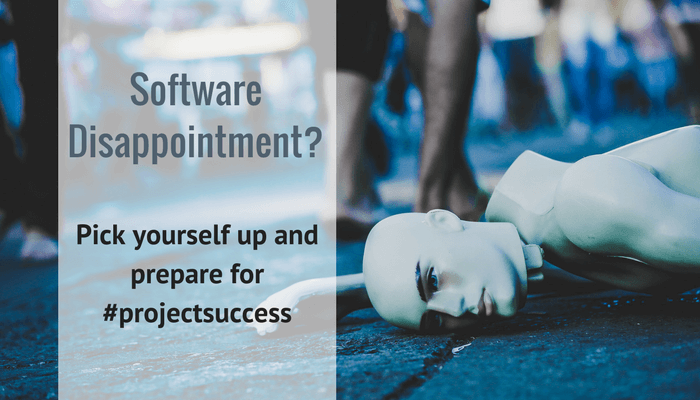 If you are struggling with the software disappointment gap, get in touch. We work with retailers to equip internal teams for the project efforts ahead. Our project management tools are light and flexible for retailers.